Learn to play West African drum rhythms with BeatRoot! BeatRoot plays traditional Manding rhythms from West Africa. We play djembe, doundounba, sangbang and kenkene drums. West African drumming is an accessible, enjoyable, stress-reducing and energising group activity that can improve your musical skills and bring participants an understanding of the richness of African culture. 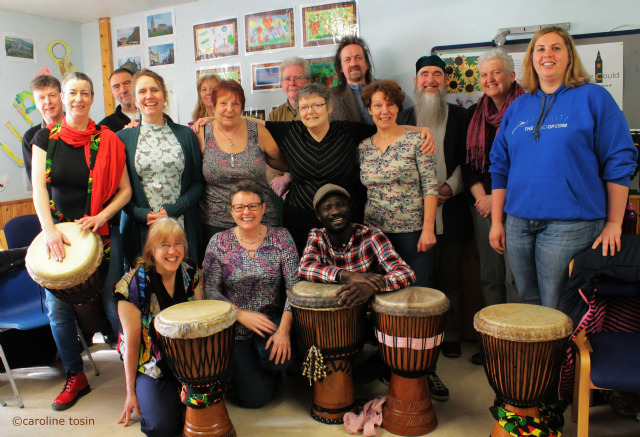 We meet every other Saturday at the Cupar Djembe Workshop at the YMCA, Bonnygate, Cupar, Fife New members to the workshop are always welcome, and thanks to Awards for All funding we have spare djembes for beginners. BeatRoot is happy to play at community arts events throughout Fife. Ever felt your feet tap to the rhythm of African beats? Ever thought, I could do that? Come on down, its gonna be fun!